Shopping center to be redeveloped. 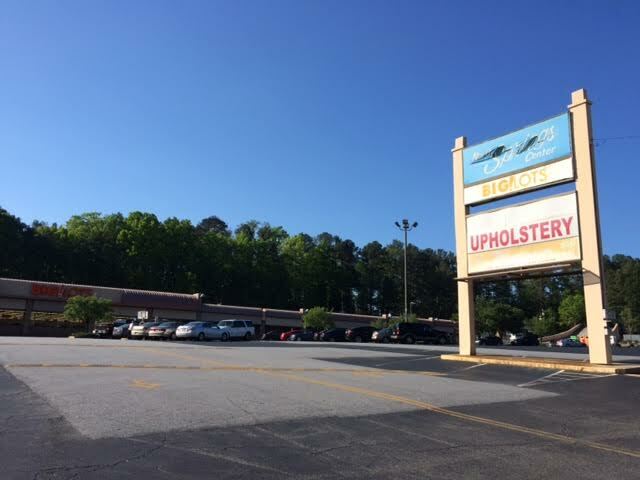 North Springs Center, a nearly 100,000 square foot shopping center on Roswell Road in Sandy Springs, will soon be demolished for new development. 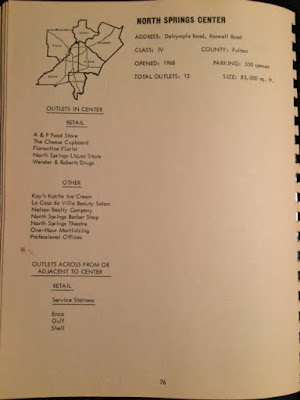 The center, originally anchored by an A&P when it opened in 1968, was also home to Wender & Roberts Drugs, Kay's Kastle Ice Cream, The Cheese Cupboard, (a once popular restaurant) and North Springs Theatre. Today, Big Lots, in the former A&P, is the center's main attraction. 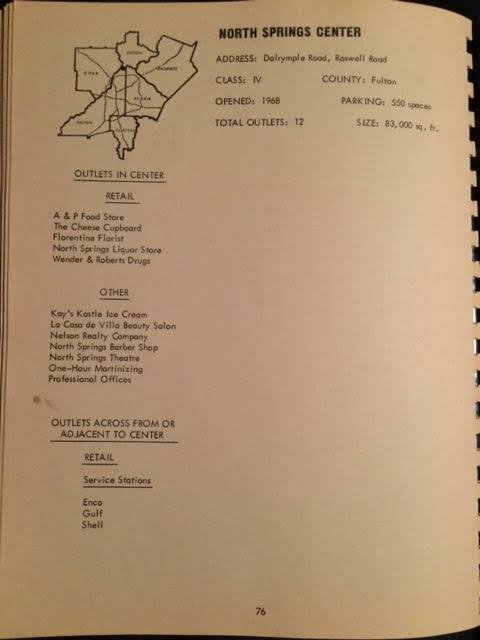 North Carolina's Eastern Federal theater chain opened the single screen North Springs Theatre in 1968. 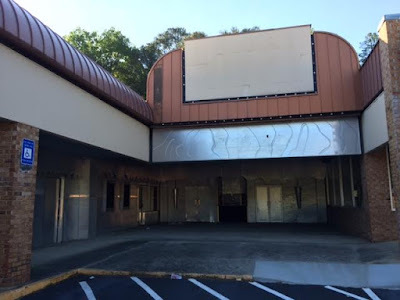 It was "twinned" in the 1970s and became North Springs Cinema ‘N’ Drafthouse in 1991. The cinema and drafthouse concept lasted a few years before closing and later reopening under new ownership. The space was for a relatively short time home to Carnaval, a Latin nightclub in the early 2000s, but today sits vacant. Wender & Roberts currently occupies a former Krispy Kreme in Roswell, about 5.5 miles north of North Springs Center. Nyonya, a Thai, Malaysian & Chinese restaurant, still has both its name on the large street signage and on its own space, but has been closed since last year. 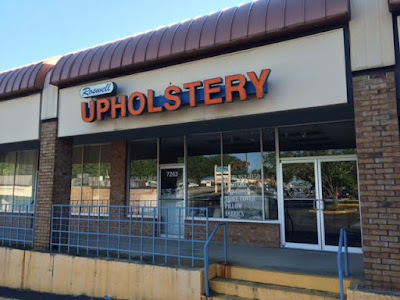 The only space I found that was still occupied (other than Big Lots) was an upholstery business located near the former movie theater. A freestanding emissions and U-Haul business, around the corner from the former dry cleaners, is also still operating. Roswell Upholstery remains in business... for now. 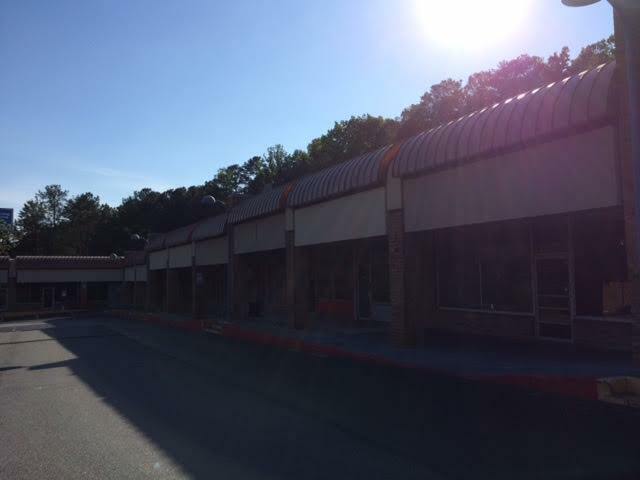 The nine acre center is located in the 7300 block of Roswell Road, just south of North Springs High School. 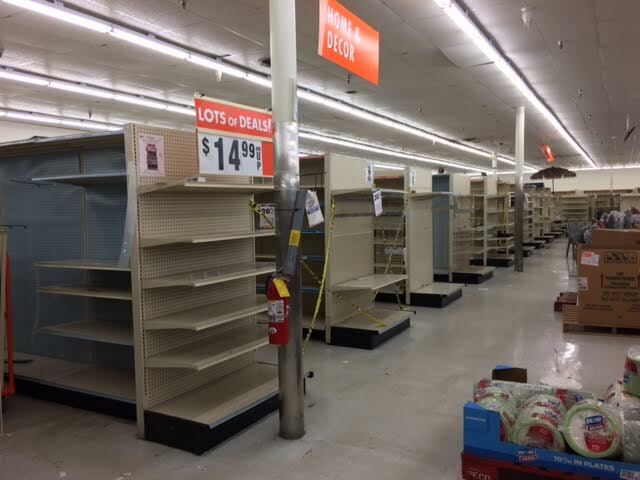 The center is anchored by Big Lots, but the off-price retailer is actively liquidating ahead of a planned mid-May closure. Amazingly, at only 30% off, the store is more than 50% cleared out with large portions of the store roped off due to the empty shelves. In DeKalb county, Big Lots closed their store at Suburban Plaza in early 2015. Suburban Plaza was redeveloped by its owner Selig Properties and is today anchored by Walmart, ROSS Dress For Less, HomeGoods and LA Fitness, among others. 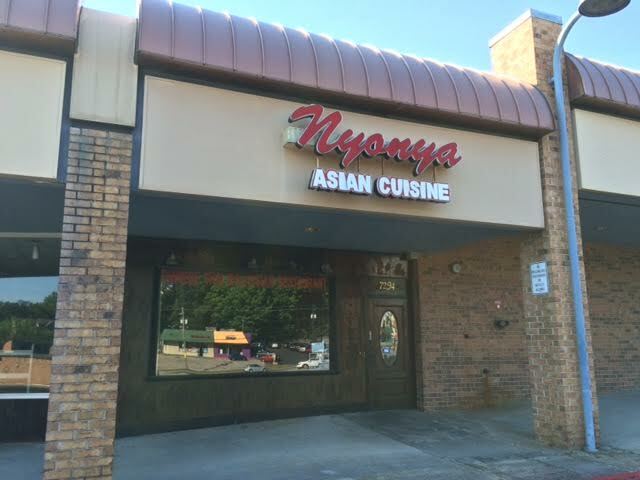 It is not yet known what redevelopment may come to the North Springs property but before it can be marketed for sale, ownership is reportedly dealing with contamination from a former tenant. Prestige Cleaners, a dry cleaner that operated in an endcap space at the northern end of the center from 1996 until its eviction in late 2015, is reportedly being blamed for leaking toxic dry cleaning solvents. More on this can be found in an in-depth report recently published by Reporter Newspapers. 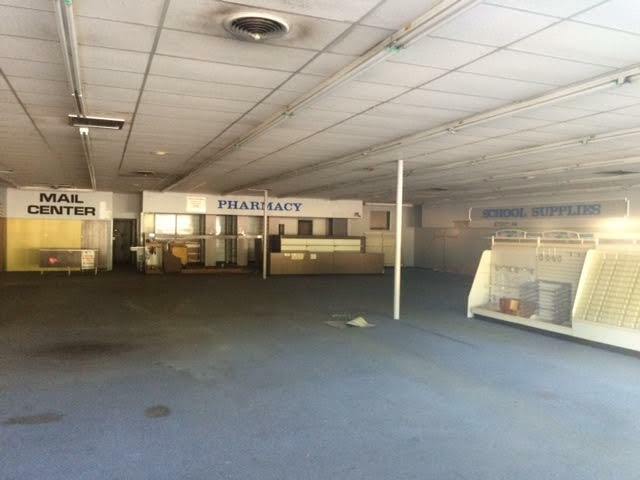 Just south of the shopping center, sits the former Tom Jumper Chevrolet dealership. 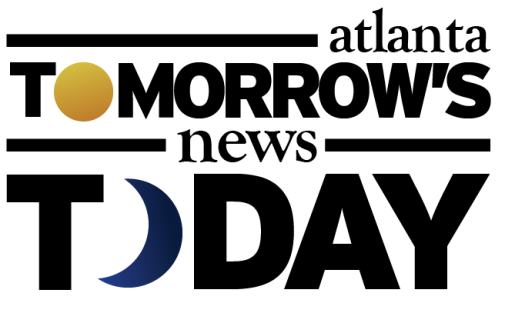 The dealership sits on just over 11 acres and had sat largely idle following parent company Bill Heard Chevrolet's 2008 Chapter 11 bankruptcy filing. 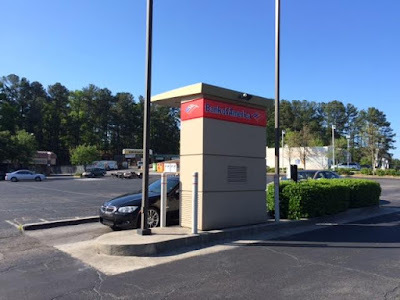 Last year, RBM of Atlanta, a Mercedes-Benz dealer, took over the lot to use as overflow for their existing lot less than a mile up the road as well as for pre-owned and Sprinter sales. 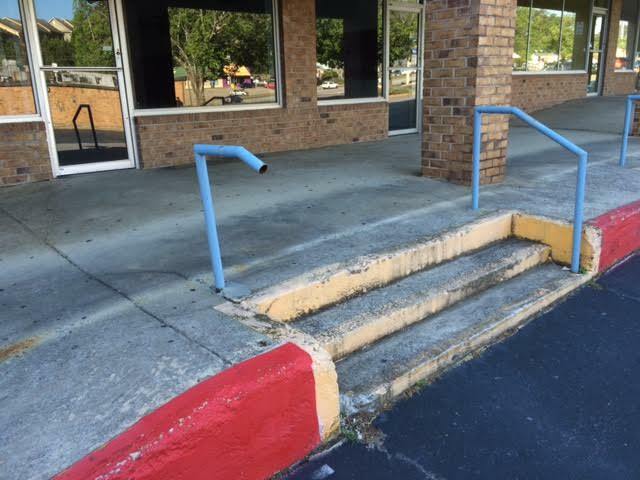 What would you like to see happen to the North Springs Center property? What is your fondest memory of the center? Are you worried about the potential contamination from the former dry cleaners? Apparently the rumor flowing in that area is that it will be demolished and townhomes will be built on that property. I didn't realize there were Kay's Kastle Ice Cream stores as far south. The center was remodel in the mid 80s with the A&P becoming a FutureStore. Given the size of the center, maybe Walmart Neighborhood Market. That revelation surprised me as well. 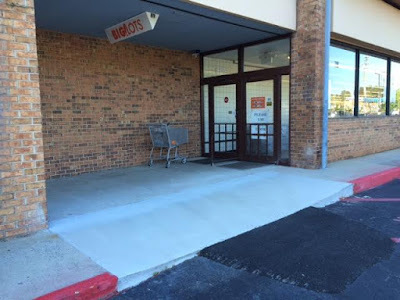 There were dozens of Kay's Kastles stores around north Georgia and Alabama and southern Tennessee into the early 1980s, but this is the first I've heard of one anywhere south of Cartersville. I wonder whether there were others here. The only Kay's Kastles left is in Soddy-Daisy TN and gets its ice cream from Mayfield, and the only Kay's - the original company which later became a separate entity - is in Knoxville and gets its ice cream from Greenwood here in Atlanta. I would presume town homes as well. 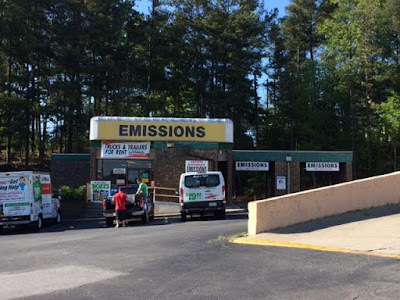 It's too far up Roswell for any kind of destination retail and the surrounding centers have the basics covered. Plus, the city isn't going to allow anything on Roswell that will compete against city springs.  I would imagine all the apartment complexes north of Abernathy will get bulldozed for townhouses once the owners decide it's more profitable to sell that continue maintaining the aging complexes. I bet this shopping center was great back in the day. Thanks for providing the details. Given that there is only room for so much retail these days I guess residential is better. Was a great shopping center in its day and was the centerpiece of North Springs activity. Had my first beer from the liquor store there when we got someone who was 18 to buy it for us. Movie theater was great and saw many (now classic) movies. Shopped at Wender & Roberts every week. Got our groceries from the A & P. Cheese Cupboard po-boys were great. Got my hair cut at the barber shop for 40+ years. Aw, this makes me sad! While the center is definitely run down and mostly empty, it was a great place in the 70s and 80s. My dad had a men's clothing store there when I was born and we lived just down the street. I have so many fun memories of walking to the center, getting candy at Wender & Roberts, or maybe ice cream from Baskin Robbins. 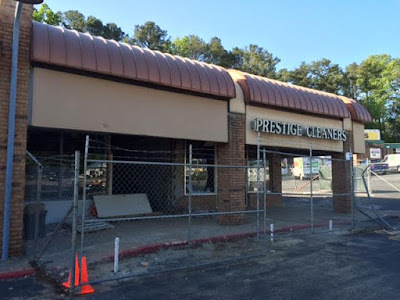 I hope whatever is built there helps to continue to improve Sandy Springs and Roswell Rd. What is so pathetic is that the city has allowed the shopping center to become so run down and done nothing about it. Certainly it is not according to any city code and has been that way for the last several years. It is in total disrepair, a weekend and holiday truck stop/ parking lot, and getting worse. At this point anything and anyone who keeps it up would be welcome. The Mercedes takeover of Jumper does not look any better than it did....run down. We thought that it would look better under Mercedes but alas it does not. So sad for tose of us who live north of Abernathy and have to look at it. Sad for our home values too. I've been in the neighborhood since 1971 and the ice cream place was Baskin Robbins, not Kay's Kastle. 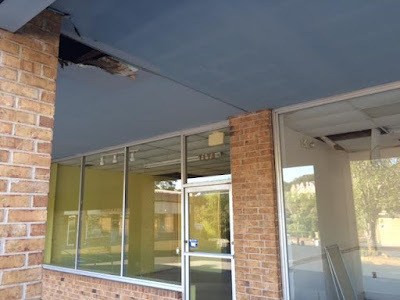 Another store not mentioned was a ladies' boutique and shoe store nextdoor. It was great having Wender & Roberts. Besides being a pharmacy, they carried a lot of high end cosmetics and perfume such as Chanel and they gift wrapped. The drug store also delivered and this service was great when your children were sick and you needed something. No more apartments! Some of the apartments around us need to be demolished!!! I'm ok with nice condos or townhouses. I'm cool with retail like a nice market, coffee shop and restaurants local citizens can walk or bike to. 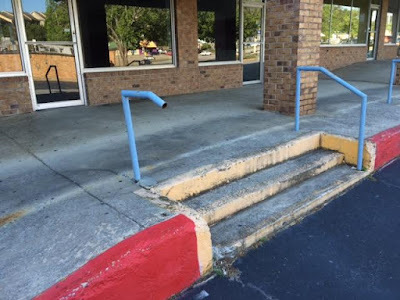 I hope the shopping center is demolished soon.